Add 1 1/2 cups of the onions, the garlic, beef, 1 teaspoon of the salt, the pepper and broth to insert. Secure lid; set pressure valve to SEALING. Select MANUAL; cook on high pressure 30 minutes. Select CANCEL. Keep pressure valve in SEALING position to release pressure naturally. Discard cooking liquid; stir in fresh oregano. Meanwhile, in small bowl, mix yogurt, cucumber, dill weed, lemon juice, garlic powder and remaining 1/2 teaspoon salt. Refrigerate until ready to serve. 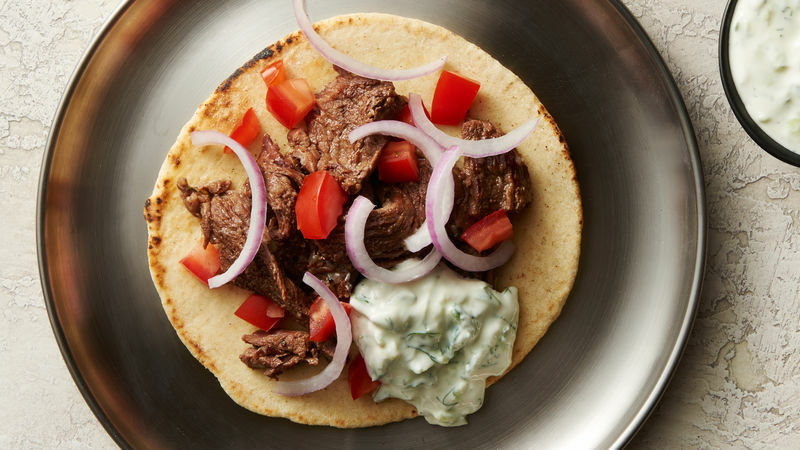 To serve, divide beef mixture among pitas; top with remaining onions, tomato and yogurt sauce. To easily shred cucumber, use a box grater. Want more toppings? Try sliced cucumber, feta cheese and shredded lettuce.